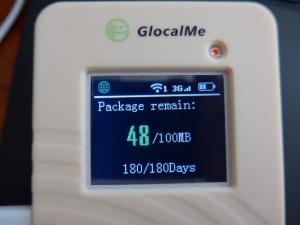 The GlocalMe G1S is a SIM-free global hotspot device that works in 108 countries and allows up to 5 devices to connect via Wi-Fi. 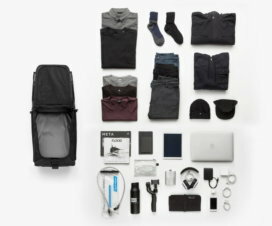 It is featured as one of our best travel gadgets. Here’s a hands-on review that also discusses the GlocalMe G2 model. 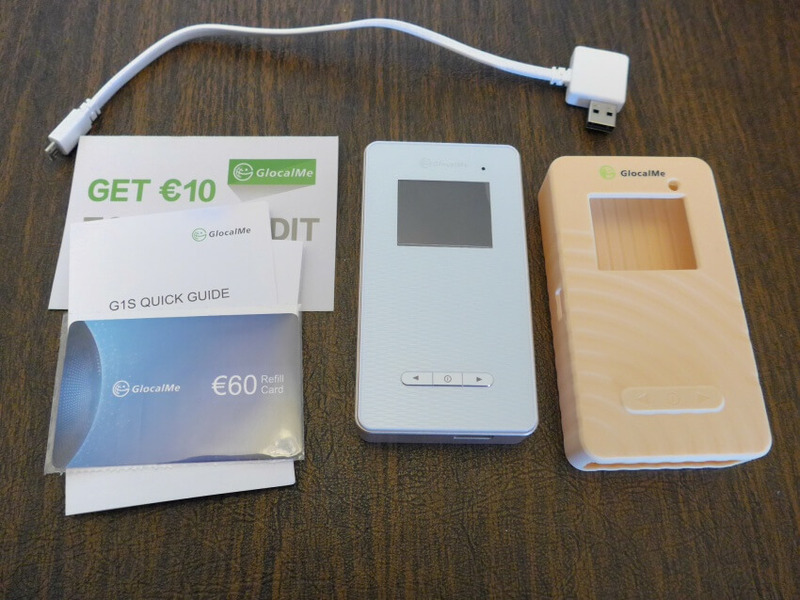 In The Box: GlocalMe G1S global hotspot device, USB cable, silicon case, quick guide, manual, €60 Euro refill card, and €10 refill offer. 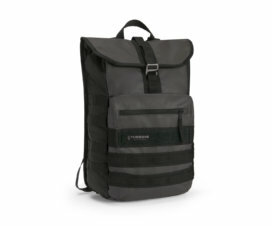 Apperance: The GlocalMe G1S feels sturdy and is about the size of a portable hard drive but heavier (8.1 ounces with the case). 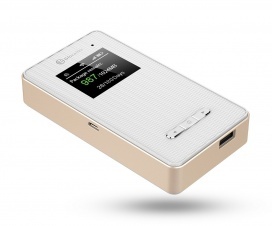 There is a micro USB port to charge it and a USB port to use the 6000 mAh battery as a power bank. The silicone case was unexpected and a nice addition as it fits the G1S perfectly and adds a bit of ruggedness. Installation: The G1S takes a few minutes to connect after turning it on. The main display shows how much data is available on your current plan. The device comes with 100 MB available out of the box so you can test it out without having to spend more money. I set up my account with the GlocalMe Android app. It activates the device by reading the QR code on the device’s display. Pressing the right arrow on the G1S shows the QR code. You can also set up an account at the GlocalMe website but you will have to type in the IMEI number that way. The app is not required to use the G1S, but it makes things easier. Pressing the right arrow again shows the Wi-Fi network name (SSID) and the password. When I first connected to the Wi-Fi network, I couldn’t access the internet. I restarted the G1S and it worked. The IP address is in Germany and when I searched with the address bar in Chrome (on my laptop), it displayed results using Google.de in German. This can be prevented by using google.com/ncr instead. 0.88 Mbps isn’t amazing but after surfing a bunch of sites and uploading some photos, I found it to be very adequate and could see myself getting work done with it. If the connection in other countries is similar to this, I would be satisfied. According to the manual the battery will last up to 10 hours. App and Adding Data: Use the GlocalMe app to easily top-up your account or buy data packages. Buying more data can also be done on the website. You will need to use either Alipay or Paypal for both options. I redeemed my €60 refill card with the app. 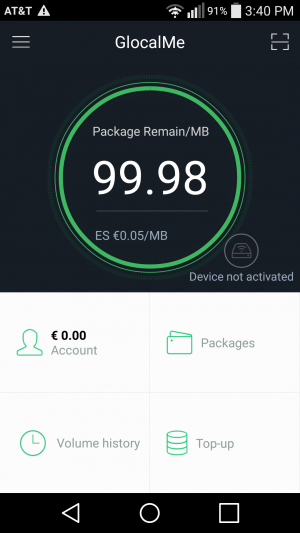 At first it looked like the refill card could only be used for topping up (which is charged at €0.05 per megabyte for data that never expires), but once you redeem it, the refill card appears as a credit that can also be used to buy data packages. The data packages offer better rates with a variety of plans, but will expire after a certain time depending on the plan (some after a month, others after a year). The app lets you easily search by country to see what packages are available, and there are some special packages for Asia. Currently China, Hong Kong, Taiwan, Japan, South Korea, and Southeast Asia (including Cambodia, Indonesia, Malaysia, Philippines, Singapore, Thailand, and Vietnam) have special packages and all other countries can use the “global” packages. The G1S versus GlocalMe G2: The GlocalMe G2 (amazon) is now available and offers 4G connection as well as 2 SIM slots so you can also use it as a traditional hotspot with your own carriers. The data and plans are the same prices for the G2 as they are for the G1S. 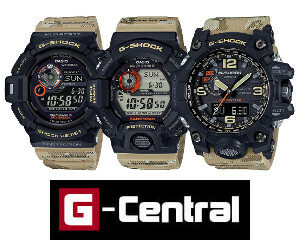 The G2 is currently $159 and the G1S is $98.99 (as of 1/25/16). It would have been nice to have 4G speed, but as I intend to use the G1S as an emergency backup connection and not a main one I don’t mind having the G1S at a significantly lower cost, especially considering the free €60 refill card that is included. The G2 doesn’t come with a €60 refill card. Most people should be satisfied with the G1S but those who need the fastest connection possible should go with the G2. Summary: The GlocalMe G1S is simple to operate, easy to top-up, always shows your usage and remaining data on its display, and is also a power bank. Negatives are that the Wi-Fi password cannot be changed, payment for additional data must be done with Alipay or Paypal, and it is not 4G-compatible. Also if you lose the device, anyone can see the Wi-Fi password on the display and use it (though you can immediately deactivate the device with the app or on the website). The usefulness of the device makes it a worthwhile purchase, especially with the generous amount of free data included. 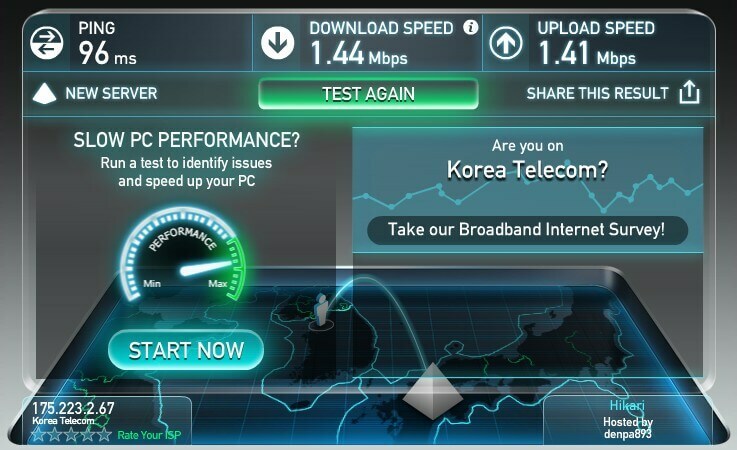 I had a chance to test the GlocalMe G1S in the airport town of Unseo near Seoul, South Korea. As you can see from the speed test, I got even better results than I did in Honolulu with a 1.44 Mbps download speed, but there were a few hiccups. I still had about 30 MB on my general worldwide pay-as-you-go plan. I had also added a the Southeast Asia package and I added a Japan/South Korea package after that. I thought the device is supposed to detect your location and use the appropriate package but I had to use up my general worldwide pay-as-you-go data before the device started using the South Korea package, and there didn’t seem to be any way to change that through the device, app, or website. Also after using a few megabytes the night before, I couldn’t connect to the internet at all in the morning but it started working again about half an hour later and I didn’t have any problems the rest of the day. 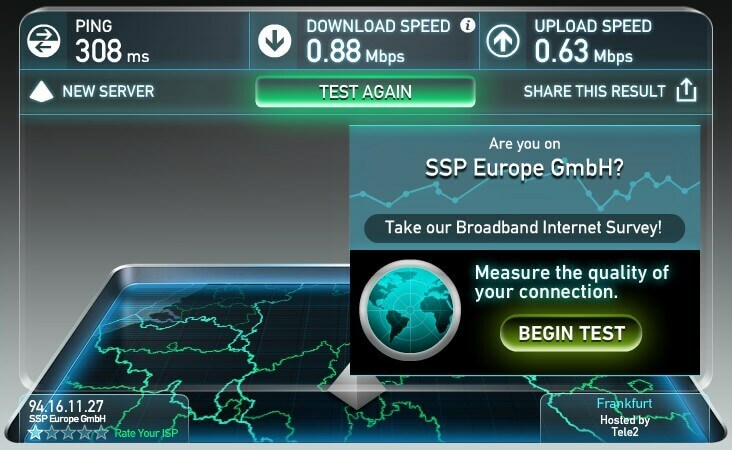 I used about 400 MB with my laptop and the speed was very satisfactory. For normal web surfing it felt just like my home DSL connection unlike my initial testing in Hawaii. Also the silicone case did a good job in protecting the device when it took a one foot drop off a coffee table. Using the G1S in Phnom Penh, Cambodia with the Southeast Asia data package produced even better results with a ping of 50 ms and a download speed of 5.86 Mbps. 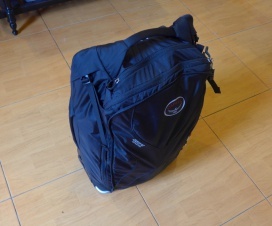 The G1S and its fast and reliable connection proved very useful in Phnom Penh with its frequent power black outs and internet outages.